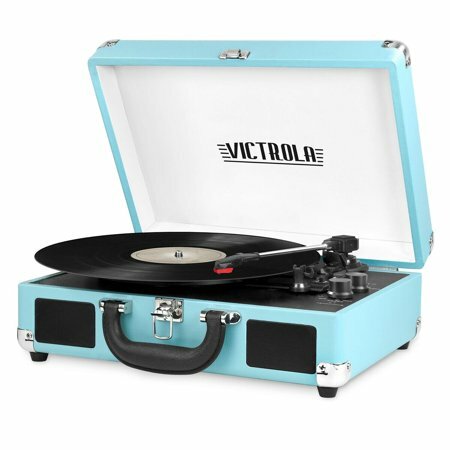 The Victrola portable suitcase turntable is an absolute classic and loaded with features. Includes built-in Bluetooth technology to wirelessly stream music from any Bluetooth enabled device, 3-speed turntable and 3.5 mm aux-in jack for playing music from any non-Bluetooth device. Portable design and carry handle allows for tunes wherever you may go. This record player is very nice, it plays smooth looks great and the volume gets really loud for a suitcase record player. It's very easy and convenient to put away and doesn't take up alot of space. I bought this turntable for my mother's 96th birthday, she and my dad had a lot of records. She recently found them in the store room. Brought back a lot of fond memeories, especially since dad passed . Delivered as promised. Good item. I am very happy to have ordered it. Husband opened gift. It was exactly as advertised. Affordable turntable. love love love!!!! plays great! the Bluetooth works on my phone to play spotify. Nice durable case. I was so happy to find this adorable record player at this cost! Works perfectly, I love it! I bought it for my son and he's loving it!! I bought this to play oldLPsintbeguest room. Didn't expect a lot since I was buying it for its cmpact size. Speakers are tiny with little bass, but sound quality is decent. Cute but.... Exterior speakers not working. Only sound via headset/earphone. ..